Amazon's always-on voice assistant lands on a quality portable format. These days, the launch of yet more speakers with Alexa onboard isn't the most exciting announcement. However, these aren't stout smart home speakers or a mere software update, but an entirely new line for Ultimate Ears -- a long-standing favorite for its speakers' audio output and resilience. 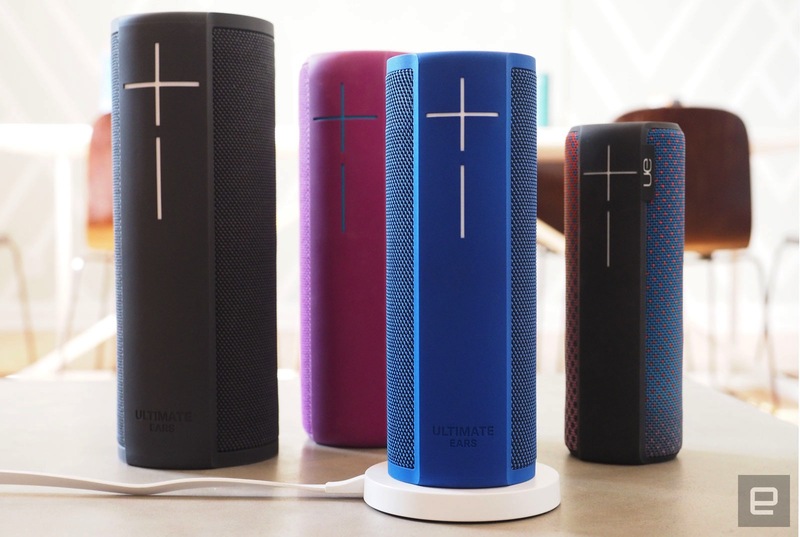 Today, the company introduces the Blast and Megablast, the network-capable and Alexa-enabled siblings of UE's Boom 2 and Megaboom. This new line was built explicitly for the Amazon Alexa ecosystem of apps and features, and along with the Power Up charging base, offers always-on functionality to cater to your verbal demands. Unlike many other options though, this one also includes an on-board battery for portability. Fans of the Boom 2 and Megaboom don't have to worry, as those products will continue to exist (along with the tiny Wonderboom), but the new models eschew some Bluetooth features in exchange for a focus on WiFi connectivity. The main difference (aside from Alexa) is that the Blast and Megablast will only work on their own or in tandem over a WiFi network. 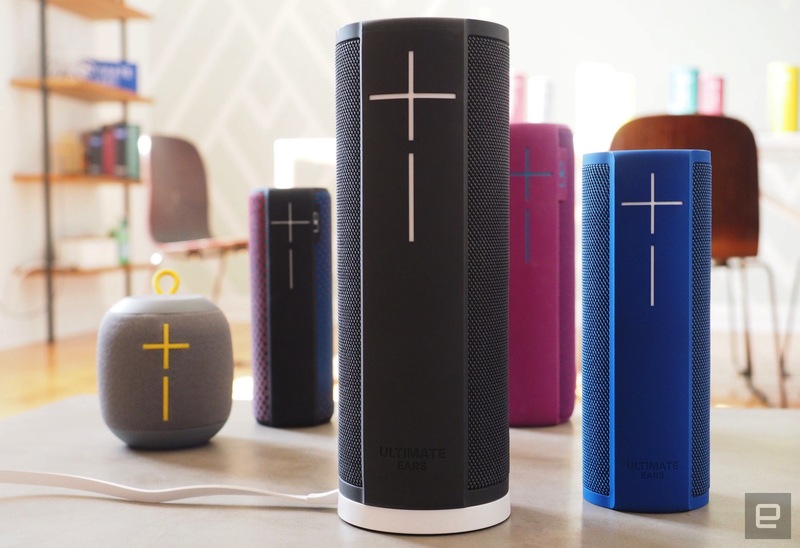 Without that connection, they operate as a regular Bluetooth speaker with devices like a phone or tablet as the musical source. There are no more Bluetooth-based Double Up or Party Up features here and the 3.5mm jack has departed as well. To offset this, while also improving on a successful formula, UE has boosted the max output of the Megablast to 93 decibels, which calculates to a 40 percent increase in loudness over the already beefy Megaboom. We haven't had a chance to compare the two, but it seems like more than enough considering how good the OG already sounds. Both the Blast and Megablast are slightly larger than the Boom 2 and Megaboom versions, most notably in height and weight. With Alexa onboard, you may end up using them as home-based units more than on-the-go sound though. The Power Up is a wireless charging dock, so it's incredibly easy to move them from room to room or grab for the road -- switching over to Bluetooth, of course. These new models are about half an inch taller than their counterparts, and the Megablast jumps up considerably in weight, gaining nearly a pound. That weight accommodates added microphones and a reworked driver/passive radiator setup, helping to pump out its stated volume boost. The maximum battery life on both has dropped a bit compared to the Bluetooth-only Boom series, with up to 12 hours on the Blast and 16 for the Megablast, but I'm guessing these devices will mostly live in the home. Plus, depending on how loud you play music, those ratings are actually pretty accurate. Playing at full volume though always knocks the numbers down to a few hours in my experience -- with the larger of the two showing significantly more stamina than you'd think. On the Alexa interface side, people in the US, UK, Germany and Austria get hands-free access to music services including Amazon Music, iHeartRadio and TuneIn, with Pandora and Deezer lined up for future inclusion. You also get access to other Alexa services such as news reports, weather, audiobooks, voice control of compatible IoT devices, general inquiries and more than 25,000 skills. The speaker setup is controlled through a new UE app tailored specifically for the Blast and Megablast, helping to get you onto your WiFi network and link your Amazon account for those Alexa services. Ultimate Ears' Blast and Megablast are also on a fast track to getting smarter over time with regular feature updates. Since they're WiFi-capable, this can happen automatically when on your network. Another benefit of combining Alexa with an Ultimate Ears product is that you get those services on a quality audio device in a portable package, which can be moved wirelessly throughout the home and double as your Bluetooth boombox when on the road. Pre-orders start today at the Ultimate Ears website and participating retailers for the Blast ($230/£200), Megablast ($300/£270) and Power Up ($40/£35) with items shipping soon and hitting the shelves by the end of October. Bundles including a Power Up will be available from T-Mobile, AT&T and Verizon for the Blast ($260) and Megablast ($330). For US customers, the speakers are available in Graphite (Black), Blizzard (White), Merlot (Red) and Blue Steel (Blue). Customers buying before January 13th, 2018, will also get a free three-month subscription to Amazon Music Unlimited.